As with the Awful Bosc Monitor Lizard from Week 290, this specimen came to the Grant Museum from HM Customs and Excise, after it had been confiscated from someone who had illicitly traded or exported it in contravention of wildlife legislation. This means that it was probably prepared as a souvenir, rather than a museum specimen (and probably by someone who was not at the top of their class in taxidermy school). Historically, sometimes taxidermy specimens were prepared by people who had never seen the whole animal that they were re-creating, and as such errors crept in, particularly in the size and posture of the specimen. The most famous example of this is is the gloriously over-stuffed Horniman walrus. In these cases the “mistakes” made by the taxidermist provide valuable information about the historic interpretation of these species in the public eye. It would therefore be unethical to correct them. It would be like altering a painting by an Old Master just because we didn’t think it looked like whatever they had depicted. Should we correct the owl? This brings us to the owl. There is no doubt that with those googly eyes the owl has a certain charm – it looks funny, and as such might spark some enthusiasm in a museum visitor. I have certainly used photos of it because of these quirks. The Fluff It Up project gives us the opportunity to replace its inaccurate teddy-bear eyes with a more realistic pair. But should we? Is it just a curio? As much as I know that sometimes dead animals can be funny (which museums can occasionally put to good use), I have also argued that museums today should not be considered cabinets of curiosities. 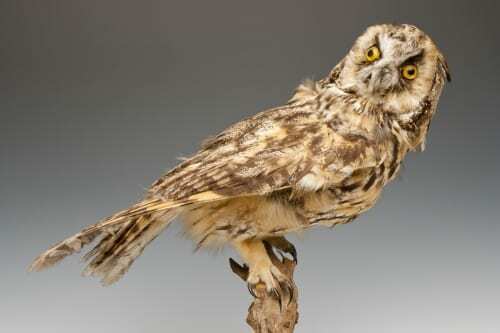 It’s probably true to say that this owl helps perpetuate that unfortunate image. 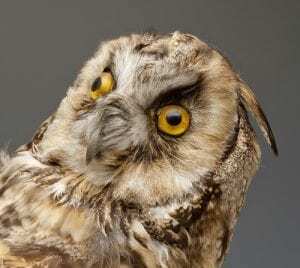 On the historical front, I suspect that the comedy eyes of this specimen do not represent a misunderstanding about what owls look like, given that they are hardly exotic (this species breed across Europe, Asia, and North America). It’s more likely just crap taxidermy. For this reason, we have taken the decision to “fix” the owl, and turn it into a more accurate specimen that better represents owl-kind. My feeling is that museums, on balance, should probably be working harder to convey what animals genuinely look like. I will miss his googly eyes, though. What do you think – do you agree with our decision to replace his eyes? Let us know in the comments box.